I recently listed a new lovely table runner in my Etsy shop. It is hand woven in a lovely rustic design. I love weaving and take great care with my woven projects. 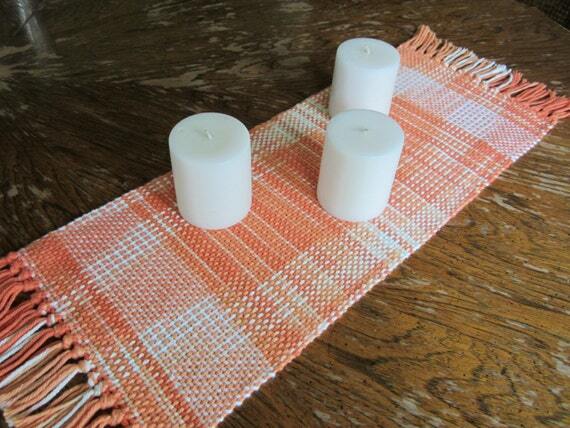 This table runner would add a lovely country touch wherever it is used. And it is such a great size, with the woven body being about 19 inches long by 8 inches wide. Plus it has approximately 2 inches of fringe on each end as well. It is made from 100% pure cotton yarn. And is done in a lovely mix of colors that include different shades of oranges and whites. Which makes it perfect for adding a bit color to your table decor. It would be wonderful for using on your dining table, coffee table, or dresser. Or anywhere else you would like a touch of rustic charm. It would be a great gift for yourself or for someone you know who loves hand made treasures.